In the process of writing these thoughts, I usually revisit the topic at hand. I read some commentary. I spend some time thinking about the subject. As is no doubt obvious by now, I seek out my way into writing about whatever attracted me in the first place. Sometimes, I don’t remember the first place and it takes some research to jar loose the necessary morsels. The research has provided all sorts of information. More than a few artists were unusual in their personal lives, like Wilkie Collins. Others had serious issues, often holding prejudices that can not be defended (and should not be). Then, there’s the bits where I seem to be on my own in appreciating something. Really, that never happens because… well… the interwebs… It is really hard not to find someone who shares your infatuation. True, the mirror image is just as common. Someone, somewhere, is more than happy to rain on your parade. But that’s folks like you and me. Usually, people who are experts in their field tend to agree with me or, at least, fall somewhere in the middle of the road. I was rather caught off-guard by the vigorous knocking that professional critics have given Treme. You could put some of it down to David Simon’s status as a critics’ darling in the wake of The Wire… or maybe that’s it. I don’t know. The weird thing about reading critics like I’ve been doing is that you notice the ebb and flow of critical opinion over time. Some of my subjects died more than a century ago. People still write about them, sometimes trying to tear down idols and sometimes to restore them to their perch. In general, you could blame that on critics 1) starting with a conclusion and then writing to justify it; or 2) relying on criteria that they believe matter. Look, for every thing that I have written about, there are ten that I have not liked. That could be because I started out with a bad opinion and it just wasn’t going to change or perhaps I gave the thing a chance but my criteria at that time were just not going to be met. I’d love to believe that universal criteria for quality art exists, but I think that ultimately the only bad art is whatever bores everybody. If somebody finds your creation a little invigorating and helps brighten a few moments, more power to you. Maybe the next creation will work for two people. Treme had some problems that nobody could miss, but it also spoke to me about the price of recovery and the comfort found in art and food and working with your hands. It spoke about the importance of place, whether you stay or go, and how you carry place with you forever. 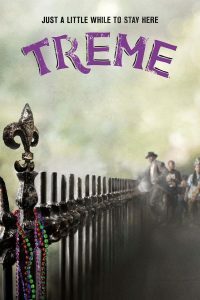 Treme made me feel like I was part of a large country with room for more pain and more miracles than any single heart can hold. You’ve Got to Check This Out is a blog series about music, words, and all sorts of artistic matters. It started with an explanation. 42 more to go.